This is a basic Cheap Apple iMac. It will not update to the current operating system and will not run some current applications. It is ok for basic use but nothing more. They are a Cheap Really basic model. Please do not buy this model if you need to run some current applications. Please check what you need to use it for and make sure it will work with the programmes you require to run. The Maximum Operating system this will run is OSX 10.11 El Capitan. This is a Clearance model and is only £149 as it does not run some current software. 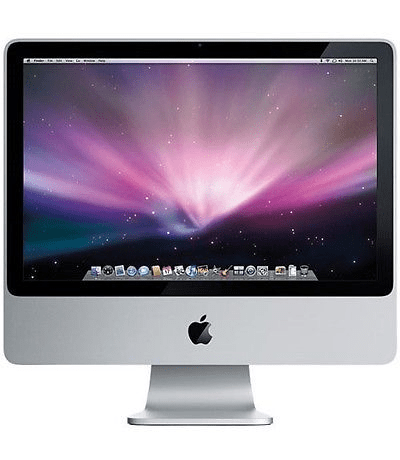 The iMac “Core 2 Duo” 2.0 20-Inch (Aluminum) features a 2.0 GHz Intel “Core 2 Duo” processor (T7300), with two independent processor “cores” on a single silicon chip, a 4 MB shared level 2 cache, an 800 MHz system bus, 2 GB of RAM (667 MHz DDR2 SDRAM, PC2-5300), a 160 GB (7200 RPM) Serial ATA hard drive, a vertically-mounted slot-loading DVD+R DL “SuperDrive”, ATI Radeon HD 2400 XT graphics acceleration with 128 MB of GDDR3 memory, a built-in iSight video camera, and built-in stereo speakers underneath the 20″ glossy TFT Active Matrix LCD (1680×1050 native) display designed to “bounce sound off the desk below”. Connectivity includes three USB 2.0 ports, a Firewire “400” port and a Firewire “800” port, built-in AirPort Extreme, and Gigabit Ethernet, as well as mini-DVI, which supports an external display in “extended desktop” mode. Externally, the “Aluminum” iMac “Core 2 Duo” models feature “elegant” aluminium cases and have a glass cover that “joins precisely to the aluminium enclosure creating a virtually seamless front surface” — compared to white plastic cases used by the models these replaced. Internally, some “Aluminum Core 2 Duo” models have faster processors than their predecessors, but all have a faster “Santa Rosa” motherboard design with an 800 MHz frontside bus (up from 667 MHz), additional RAM capacity, and both a Firewire “400” port and Firewire “800” port.